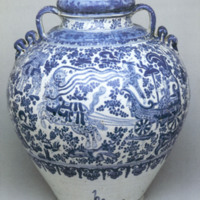 This ceramic vessel, elaborately painted with blue-on-white designs, is typical of pottery made in the city of Puebla, New Spain in the 17th and 18th centuries. 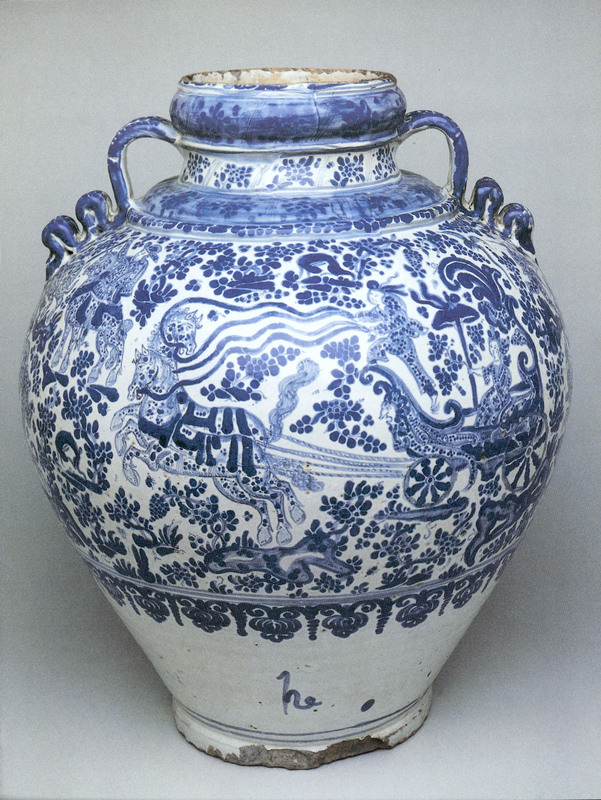 The inspiration for Puebla's blue-and-white wares came from China and Europe, yet potters in New Spain transformed foreign ideas and forms into their own, distinctive aesthetic. The forms of the curving handles of this vessel have parallels in Chinese ceramic jars and in jars from Spain used for olives. Horse racing and bull fighting scenes cover the central portion of this vessel. While equally vivid narratives are also found in Chinese and European ceramics, the spectacle of bull fighting may have had special appeal in Spanish America, where it was a popular entertainment during festivals. The lavish use of blue was part of the Puebla aesthetic, as was the tiny dots of glaze, which fill the background of the design, and decorate the horses, human figures, and carriage. Below the design field, the letters, “h.e.” appear as if a kind of signature, suggesting that Damien Hernández, a master ceramist working in Puebla during the late 17th century, made this vessel. Although scholars can not be certain who made this vessel, or who first owned and used it, the pot would have involved the work of an accomplished ceramicist and painter. Damien Hernández, to whom it is attributed, was a member of Puebla’s ceramicists’ guild. Elegantly decorated vessels like this one were crafted for affluent patrons, who used them in their households to store liquids—usually water or wine. Similarities among surviving examples suggest these vessels were painted as sets or multiples. The Puebla region had extensive clay beds well suited for making pottery and the area became a colonial center for ceramic production. A vessel like this would have been a collaborative project among skilled craftsmen: some worked the clay. Others shaped the pot, yet others painted its surfaces. This work measures 47 cm. Royal prohibitions on certain American exports meant that Puebla pottery circulated only in the colonies, and never garnered an international audience during the colonial period. At the turn of the 20th century, Puebla ceramics caught the eye of North American collectors. As a result of their endeavors, prominent collections of Puebla ceramics can now be seen in the Metropolitan Museum of Art and the Hispanic Society of America in New York, where this vessel resides. In the 17th and 18th centuries, Puebla de los Angeles was New Spain’s ceramic center. Situated along trade routes linking the Pacific and Gulf coasts, Puebla knew well imported ceramics from both Europe and Asia. Vessels such as this one show how diverse cultural influences—Chinese colors and vessel shapes, Spanish color combinations and patterns—were re-imagined and re-worked by colonial craftsmen, who ultimately created something wholly new. Reproduced courtesy of the Hispanic Society of America, New York. Acuña, Patricia. 1987. Talavera de Puebla. Puebla: Gobierno del Estado de Puebla. McQuade, Margaret Connors, ed. 1999. Talavera Poblana: Four Centuries of a Mexican Ceramic Tradition. New York: Americas Society Art Gallery. Talavera Poblana. 1979. Mexico City: Fomento Cultural Banamex.